When she enrolled in Radcliffe's graduate school in the fall of 1940, Elizabeth Colson was, in the groping fashion of nearly all graduate students of the day, at the same time an idealist, a pragmatist, and, of necessity, an optimist. In 1940, her chosen field of anthropology was a stripling among academic departments, and was taught on the departmental level at only three institutions of higher education in the United States (Berkeley, Columbia, and Harvard). Elsewhere, if taught at all,, anthropology was combined with departments of sociology, and sometimes also with economics. In the early 1940s, opportunities for gainful employment were sufficiently limited (even for males) to discourage all but truly devoted scholars from entering the field. 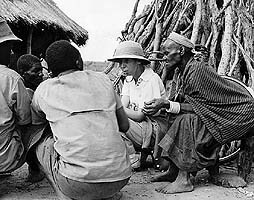 Elizabeth had discovered anthropology as an undergraduate at the University of Minnesota in the 1930s. It was love at first encounter. The challenge of a field which had brashly undertaken the task of studying humankind in all its pursuits in all places and at all times offered a promise which Elizabeth could not resist. She felt anthropology was a science that would integrate all existing knowledge about humankind. To do this, it would draw upon and enrich our understanding of political science, sociology, economics, psychology, religion, ethics, the arts, medicine, history and law. In the process, anthropology would provide a new depth and breadth of comprehension about the forces that shaped human behavior. The challenge of the field was immense, and the potential gain to society was beyond imagination. 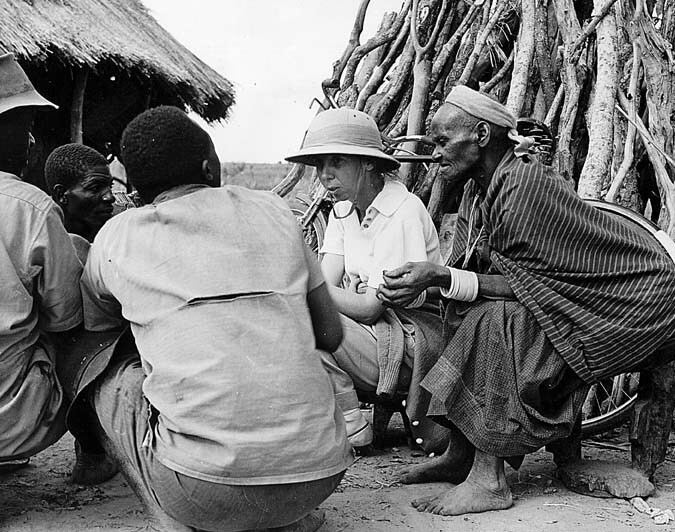 To join in this effort during the formative stages of anthropology and to contribute to the collection and analysis of anthropological data to the full extent of her ability became Elizabeth's mission, her commitment, and the exhilaration of her life. Elizabeth's inspiration came both from her undergraduate mentors at Minnesota, the chairman of the department and his wife, Professor Wilson D. Wallis and Professor Ruth Sawtell Wallis, and from her parents- especially, I suspect, from her mother. Elizabeth's mother, Metta Damon, graduated from Carleton College in Minnesota in 1898, while her father, Louis H. Colson, graduated from the University of Minnesota at about the same time. Her parents met while teaching in the same Minnesota school system, where her mother was a school principal and teacher of English and Latin, and her father was the superintendent and a teacher of science and mathematics. From earliest childhood, Elizabeth devoured books, loving and revering them as her truest friends. Her mother had helped bring a library to Wadena, Minnesota. Not surprisingly, all the Colson children learned to read at an early age. It was Elizabeth, however, who marshalled her brother and two sisters, corralled her brother's cart, and led them to the library when it held its periodic giveaway of surplus and worn volumes. She loaded the cart with her choices of tattered books, conducted her little platoon back home, and proceeded to enjoy her growing collection. Although she did her share of romping with siblings and peers, she apparently spent an uncommon portion of her childhood reading. A hint of Elizabeth's later love affair with anthropology came during the first decade of her life. In the summer months her family traditionally held picnics at the site of Fort Wadena at the confluence of the Leaf and Crow Wing rivers, about fifteen miles from their home. While the family was swimming, Elizabeth spent her time poking about the ruins of the old fort. One day, she returned to the group with a bone which was later identified as human. Elizabeth thereupon decided she would be an archaeologist, and in fact retained that preference until she encountered social anthropology and the Wallises. In an era before summer programs were available, she worked much of her way through college and completed the four-year program at Minnesota in only three years with outstanding marks. Graduate education in the 1930s and 1940s was not blessed with the kind or degree of financial support that prevailed in later decades, at least until recently. At the time, there were no federal funds for academic research, and money for fellowships or research and teaching assistantships was very scarce indeed. Most full professors taught nine hours a week and graded their own papers! Being a graduate student meant deprivation and poverty, while being a full professor in many institutions meant the same thing. The difference was merely one of degree. In addition, Elizabeth's family suffered economic reversals during the great depression of the 1930s, as did most Americans. Nevertheless, her parents managed to put each of their four children through college. Students like Elizabeth, and Wilson and Ruth Sawtell Wallis before her, sought a Ph.D. not as an incomeproducing asset, but as a route to becoming master craftsmen in their chosen fields. Academic fields were chosen because the stimulus of working in them far outweighed the lack of material rewards. People made academic choices because they were compelled to, because their work gave joyous meaning to their lives, and because any other career would have been drab and dull by comparison. In young Elizabeth Colson the Wallises clearly found the kind of devotion to the ideals of scholarship which they themselves possessed. They not only inspired her intellectually but helped support her financially. Although the Wallises' income was not one permitting affluence, they "loaned" Elizabeth money, asking in repayment only that she eventually do the same thing for a worthy student of her own. Elizabeth has never forgotten the Wallises' generosity. I know several young people she has helped with "loans," and I suspect there are many more whom I have never heard about. In the 1940s Elizabeth found that repaying the Wallises was an even more distant goal than meeting her bills at Radcliffe. She had received a fellowship from the American Association of University Women for her first year of graduate school, and also one from Radcliffe that permitted her to live in its only graduate dormitory, Bertram Hall. As a building, Bertram Hall was small even for the 1940s, housing about 70 graduate students who were enrolled in Radcliffe. Many more took dinner at Bertram than lived there, and students often remained in the lounge over after-dinner coffee for conversation with other graduate students and their guests. Everyone moving into Bertram Hall in the fall of 1940 was a stranger to each other, and most students were also strangers to Radcliffe and to Cambridge, Massachusetts. They came from all over the country, and indeed the world, and they represented every field imaginable from archeology to zoology, and most of the fields in between. Despite enormously varied backgrounds, they gradually discovered that they all had much in common. They were all reserved, all a little shy, and all completely serious about their reasons for being at Radcliffe. They had come to Radcliffe because they were convinced that it was among the best schools for pursuing their professions -best in terms of the quality of the faculty who were teaching there. They had come to study under leading scholars, and were quite aware that some of the leading scholars did not welcome women as students. Indeed, during her first year of graduate study Elizabeth was enrolled in one course in anthropology at Harvard which required women to sit in the corridor rather than in the lecture hall, and which forbade them to ask questions (the corridor door of the lecture hall was left open). The notion that women did not possess the intellectual capacities of men was widespread during the first half of the century. Women enrolling in Radcliffe in 1940 were aware that they were often viewed as second-class intellectuals, and they were aware that in seeking to enter male professions they would meet with considerable discrimination. They were also aware that they were different from the great majority of women in their generation because they sought to become scholars. It was at Radcliffe that these women first had the opportunity to meet other young women with the same commitment to goals and seriousness of purpose. This congeniality proved to be the basis for enduring friendships, joyous camaraderie, and many deep personal attachments. As the year progressed, Elizabeth gradually became part of a group of about a dozen students who usually dined together at the same tables at Bertram Hall, frequently ate lunch together (lunch was not served in the dormitory), and often assembled after dinner in the suite of one of the members of the dinner group for cigarettes and conversation. My earliest recollection of Elizabeth was at lunch one day with four or five members of this group, when the conversation turned to time and the fourth dimension. Elizabeth, who in my experience had been friendly but quite quiet up to that time, spoke for several moments about the concept of the fourth dimension. I was enthralled; it was the first time anyone had made that concept intelligible to me. But I was also a little awed by the wisdom of this young woman who was able to communicate it, in contrast to several of my mathematics teachers who had tried unsuccessfully to do so. I began to take respectful note of Elizabeth. I soon learned that Elizabeth was in a field closely related to mine (economics), and that her main interest in anthropology was social anthropology, although she was then enrolled in a required course in physical anthropology, which she found dull. She argued that the interesting parts of physical anthropology were those related to archaeology or medicine; physical anthropology per se had little to contribute. Nonetheless, she went off with her classmates to South Station in Boston to measure the posteriors of volunteer train passengers in order to aid in the design of more comfortable train seats. Social anthropology, however, was something else. It brought no disparaging comments from Elizabeth. Conversations I had with her about social anthropology made me aware that the reason I had been so disappointed with the one undergraduate sociology course I had taken was the inadequacy of the field, rather than poor pedagogy, as I had originally thought. I had enrolled in the sociology course in the belief that it would accomplish the goal of the old German historical school of economics, that is, to integrate economics into the social sciences. Instead, I was exposed to a bevy of new definitions of terms which were never used in further analysis. Clearly, this field of Elizabeth's, social anthropology, was setting ibout the monumental chore of integrating the social sciences with other subjects in an orderly fashion that held promise of eventual success. Even as a graduate student, Elizabeth had a talent with words and the vocabulary necessary to produce le mot juste . With economy of words and phrases, she has always painted vivid pictures of people and events. Consider this phrase, written in a letter from Africa in the early 1950s: "tired old men who have lived long with the death of ambition." Or her response while she was in the Union of South Africa to a dinner partner's question, "Dr. Colson, what is your view of the future of our country?" Elizabeth's redoubtable integrity forced her to give an honest reply: "Very dark, given Mendelian laws about dominant and recessive characteristics." Her dinner partner was a high official of the South African government. Elizabeth's avid reading habits meant that what otherwise might have been work was, for her, a pleasure. An expert in mysteries (but not in spy stories or science fiction), in gothic novels, and other such "trash" (her term), she used her love of books to sharpen her professional tools. Very early on, Elizabeth taught herself to read rapidly. It has always been a source of awe and envy for me to watch her read. There is an almost continuous, if slow motion, turning of pages, but she knows what is on them! She also trained herself in kinship systems by memorizing the interrelationships among the royal houses of Europe from the beginning of history. I discovered Elizabeth's awesome capacities for royal relationships quite by accident. One evening in the 1950s, when Elizabeth was visiting my husband and me, the conversation turned to history. A bit later my husband, who used the title as a term of affectionate respect for a few, select females, addressed Elizabeth as "Lady Jane Grey." Elizabeth responded by commenting that Lady Jane Grey was the thirty-second cousin (or some equally distant relative) of the historical character we had just been discussing. Our mouths must have gone agape, for she then proceeded to trace out the kinship ties step by step. For years after that, whenever a member of European royalty entered our conversation, one of us would inquire of Elizabeth how the royal personage was related to Lady Jane Grey. Elizabeth would screw her eyes closed for a moment of thought, and then relate the connection link by link, no matter how remote. After that first year at Radcliffe, Elizabeth went off to the Pacific Northwest to do fieldwork for her Ph.D. thesis. She spent a year with the Makah Indians at Neah Bay in Washington state before returning to Cambridge to write her dissertation under the direction of Clyde K. Kluckhohn. When she returned to Cambridge, Elizabeth economized by taking a room in the big old house of a remarkable family named Day. The Days too had suffered economic adversity. Their children had grown up and gone, and to help cover expenses Mrs. Day rented a room to a carefully screened Radcliffe graduate student. Soon, Elizabeth's association with the Days developed into a congenial friendship. The Days, too, were avid readers of books in general, and mysteries in particular. I recall that one of the paperbacks Elizabeth passed on to me, Laughing Boy by Oliver LaFarge, had been given to her by Dr. Day. Before that, Laughing Boy had been passed on to Dr. Day by John Foster Dulles during a long train trip the two men had taken together. Elizabeth's relationship with her thesis advisor seemed to be much more that of colleague than of mentor and protege As she wrote up her Makah materials, Professor Kluckhohn continually urged her to develop a "conceptual scheme" (I remember the term well, as Kluckhohn apparently used it often). This "conceptual scheme" was to be used for interpreting the data that Elizabeth had collected. Not only did Elizabeth resist Kluckhohn's importuning, but she also argued with him on the basis of principle. She firmly believed that neither she nor any other anthropologist of the day was in a position to construct theories ("models," in today's jargon) to explain human behavior. Anthropology was too new, and too little data had been collected. Thus, anthropologists had insufficient grounds for generalizing, which is what theories or conceptual schema do. Kluckhohn's position seemed to be that concepts and data collection should progress pari passu, so that theories could be continuously tested against data, and revised or discarded accordingly. This argument apparently ended in a draw. Elizabeth resisted conceptualizing, not only in her dissertation (1945) but also for a quarter of a century afterwards, when the most she would permit herself was analogy. From the vantage point of economics (which even in the 1940s had a finely articulated body of theory), it seems to me that her first "theoretical" work appeared in the Morgan lectures (1974). Because I have not seen all her published articles (as opposed to books), this date may be too late. I have always considered Elizabeth's resistance to generalizations a waste of talent. With her keen, logical mind, her command over an immense (and growing) body of historical and cross-cultural facts, and especially her profound understanding of human motivations, she seemed, above all, ideally qualified for theorizing. After completing her degree at Radcliffe in 1945, Elizabeth took a rather menial job as research assistant to Professor Kluckhohn, working in the Peabody Museum at Harvard. People in the Placement Office at Radcliffe had sighed when she visited them about job opportunities in anthropology, commenting that she was in a very difficult field. About this time (late 1944), Elizabeth moved into an apartment which I shared with another former resident of Bertram Hall. She replaced a third resident, also a former Bertramite, who was leaving to be married. Those were glorious days. Although each of us had her own interests, her own circle of friends and associates, and came and went as she pleased, the apartment and the roommates were something special. New acquaintances who were worthy of the honor, as well as potential beaus, were invited to meet our roommates. However, only those who were good conversa- or entertaining were accorded an invitation. If the hostess sensed boredom (or worse) on the part of a roommate, the guest was not invited to return. Since each of us had a number of old friends who visited frequently, the apartment was a lively place. We not only worked hard; we also had the time of our lives. As the day's work was being brought to a close sometime between 9:00 and 10:00 in the evening, each of us would hurry to be the first in a position to suggest "You mix them." We did not have drinks or wine before dinner, but we did enjoy a nightcap with smokes and widerranging conversation before bedtime. While Elizabeth worked all day in the Peabody Museum, I was writing my dissertation laboriously by hand. I had not learned to cope with a typewriter, and, knowing this, Elizabeth suggested that each evening she might type what I had written during the day. And so after dinner, while I wrote more, Elizabeth typed. I blush to recall that I even let her contribute to the purchase of the whiskey! It was in the apartment one evening after dinner in mid-1945 when Elizabeth, looking up from an anthropology journal, announced with awe that there was a job for an anthropologist being advertised. In her experience, this was a totally unprecedented event. The job was in Rhodesia at a place called the Rhodes-Livingstone Institute. Of course she would apply. I commented mildly that this was a long way from her interest in American Indians. Elizabeth's response was that it was absolutely the only opening in anthropology that she had heard of since obtaining her degree, and that she would consider herself the most fortunate of mortals if she succeeded in getting the appointment. After word of her success in obtaining the job came through, there was a flurry of excitement in our apartment to get Elizabeth prepared to move, and to celebrate her new job. In those days, the anthropologists at Harvard were a social lot, at least in comparison to the economists. They thus grasped enthusiastically at every possible occasion for a party. An appointment in anthropology at a major research institute was perceived as a coup which clearly warranted multiple parties. Elizabeth's roommates were invited to them all. These wonderful parties started between 8:00 and 9:00 in the evening, went on until all hours, and featured much hard alcohol, assorted finger foods, and good conversation. The mood was set by Kluckhohn's inevitable pronouncement: "Everyone should get drunk on a Dionysian occasion." Kluckhohn then followed his own advice, while Elizabeth, who has always had a good head for alcohol, maintained her usual dignity. For reasons I never understood, Elizabeth hated using a telephone in those days, and resisted the instrument in the most ingenious ways. In order to save her the time of running all over greater Boston to seek out information on passports, visas, immunization, and such (which she clearly would have done), I made the necessary phone calls. Because it was easier to announce that I was going to Rhodesia rather than to explain that I was phoning for someone else, I used the first person throughout. But when Elizabeth and her trunks were finally on their way, the result was severe depression at being left behind. We missed her. Even then, as now, she was the most considerate of roommates, the most exhilarating of conversationalists, the most merry of companions, the most loyal of friends. ---- Tradition and Contract: The Problem of Order. The 1973 Lewis Henry Morgan Lectures, presented at the University of Rochester, Rochester, New York. Chicago: Aldine.